This scent is a customer favorite! Comparable to "Love Spell" by VC, this scent is sweetly fruity with a light perfume without being over powering. 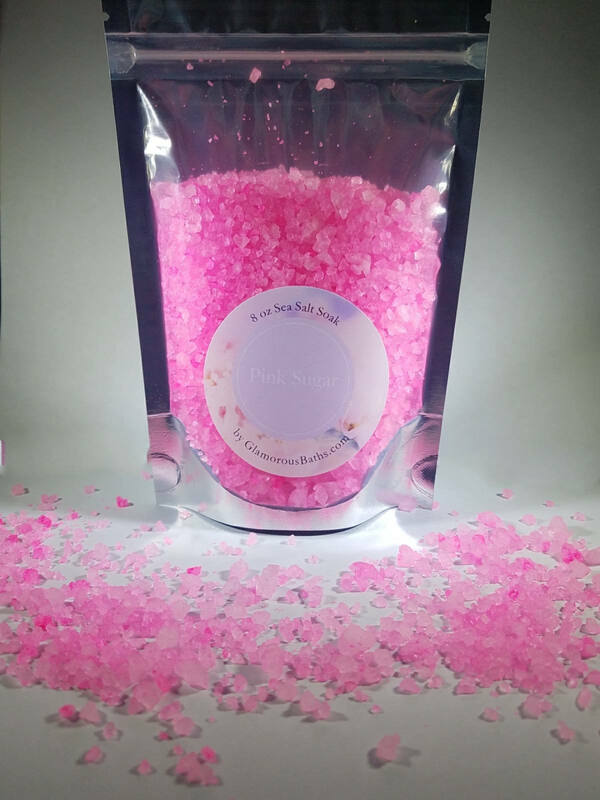 Sooth your mind and body with our Pink Sugar Sea Salt bath soak. Bath salts can carry many benefits that you’ll feel in your mood and your skin. Bath salts benefit your skin in more ways than one. Bath salts, when used in their natural, pure form, contain many beneficial minerals and nutrients that keep your skin smooth, soft, and supple. 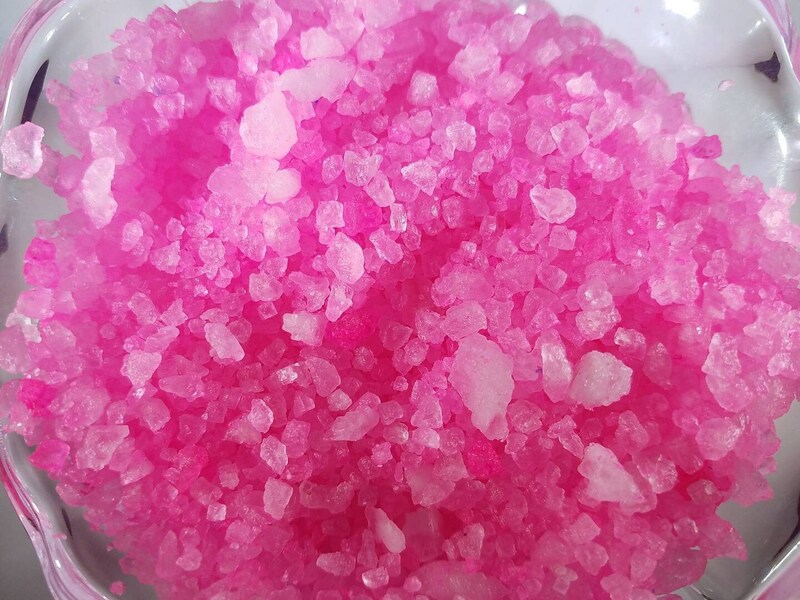 Some of the minerals found in bath salts include magnesium, potassium, calcium, bromide, and of course, sodium. These minerals are easily absorbed into our pores and are known to cleanse and purify our skin, improving your skin’s radiance, tone, and texture. Magnesium helps us fight stress and combat fatigue; calcium keeps water retention in check, promotes healthy bones and can help stave off osteoporosis; potassium balances moisture levels in the skin; bromide soothes tired, sore muscles; sodium plays a significant role in managing the balance of lymphatic fluid in our bodies. The result? 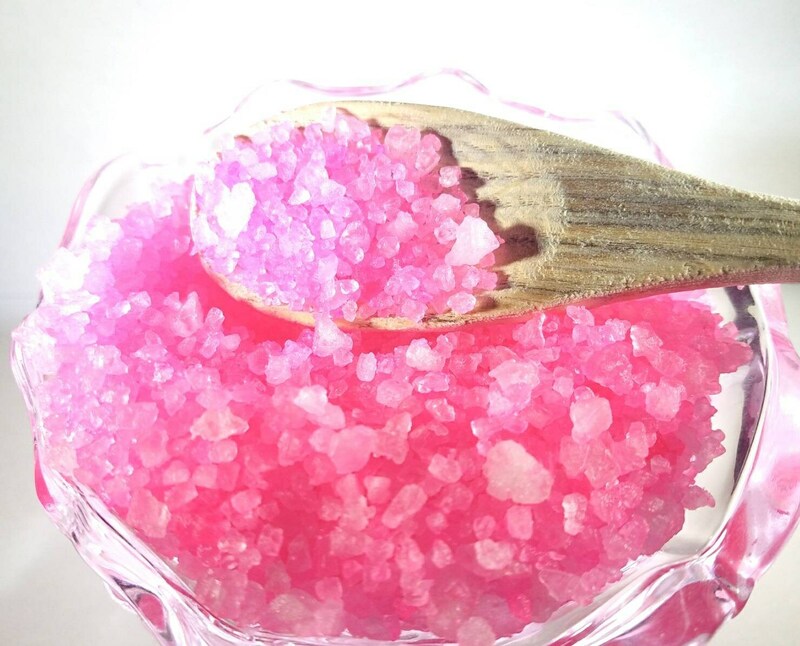 Bath salts benefit not only our skin, but our entire bodies – from the inside out. Another benefit of bath salts is that they help detoxify our skin. Warm water opens our pores, allowing the minerals in your bath salts to deeply cleanse our skin. Bathing in a solution of warm water and bath salts will work to draw out impurities, pollution, oil and dirt from the skin. 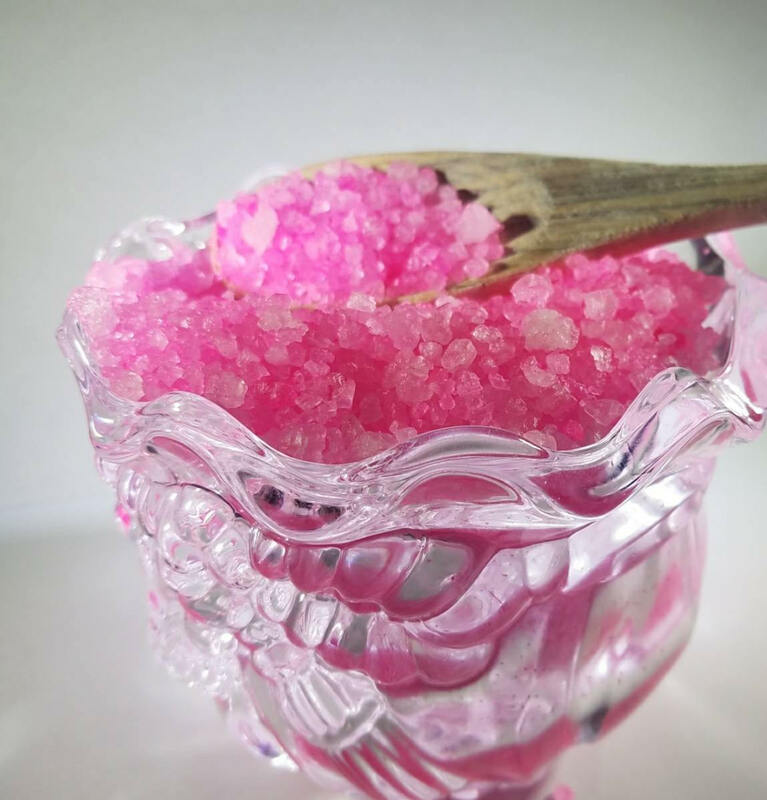 Bath salts can even bring you the added benefit of looking younger – regular use of bath salts and bathing has been shown to decrease the appearance of fine lines by plumping the skin and balancing moisture. The benefits of bath salts extend way beyond your time in the tub – after your bath, you will feel calm, relaxed, and happy. Bath salts infused with essential oils such as lavender or chamomile will soothe you and prepare you for a good night’s sleep; if you take your bath first thing in the morning, bath salts infused with citrus or green tea essential oils will perk you up, so you can start the day with focus and energy. *Please Discontinue use if you experience any side effects of bath salt use. ** Our sea salts are measured by weight. Some settling of your product may occur during shipment.